How to prepare the sauce "blue cheese"
Refined and at the same time a simple American sauce "blue cheese" is a perfect complement to meat, poultry, fish, fresh vegetables or crispy corn chips. It is not surprising that this wonderful liquid seasoning with a delicate creamy taste with pleasure have included in their menu cooks from other countries. Try to cook a "blue cheese" on the original or simplified recipes. - pinch of ground black pepper. Creme fraiche is 30% fermented cream. It's kind of a French version of sour cream, but unlike less acidic, does not clot and does not form flakes when added to hot dishes. Grate the blue cheese on a coarse grater and place in a glass bowl. Sprinkle ground black pepper and drizzle with lemon juice. Add in a bowl of cheese flavored chips and creme fraiche and mix well. If you need a smoother sauce, grind all in a blender. Let stand at least for half an hour at room temperature. Creme fraiche can be prepared independently according to the following recipe. 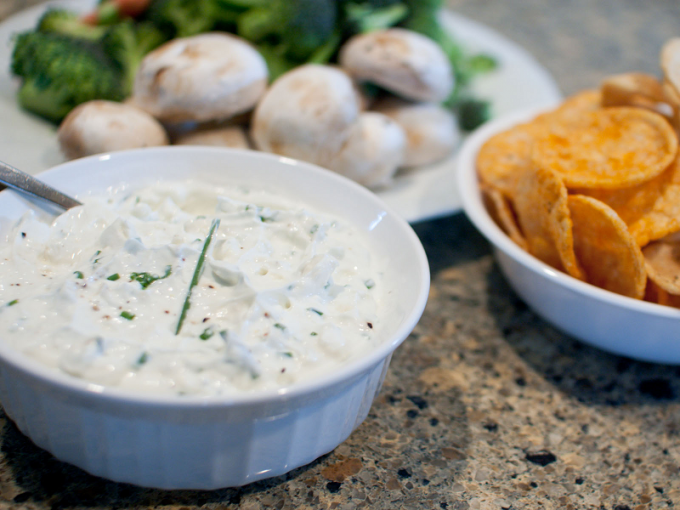 Creme fraiche is the basis of this sauce "blue cheese"
- 2 tbsp starter culture (yogurt, yogurt, yogurt or buttermilk). Remove the cream and starter culture from the refrigerator 40 minutes before cooking crème fraiche. They should be at room temperature so the fermentation process will go faster. Pour the cream into a glass jar and mix with the yeast. Tightly close the bowl with a lid, cover with a clean dry towel, wrapped in a blanket or blanket and put in a warm place with no drafts for 12-24 hours. As soon as the cream thickens, stir them with a spoon and refrigerate for another 6-12 hours. Homemade crème fraîche is not only a wonderful basis for the sauce "blue cheese", but is almost a complete replacement of the expensive mascarpone in cakes. - 1/3 tsp white pepper. Clean the garlic cloves from the skins and crush them in a special press. Combine in a bowl soft cheese, yoghurt, grated cheese, garlic and pepper and mix everything with a whisk or electric mixer on medium speed. - 15 g of fresh dill. DorBlu mash with a fork and carefully stir with sour cream, lemon juice, black pepper and chopped dill.